We welcome the partnership that we have with the parents of students attending Randolph County Schools. Your involvement in your child's education is critical to promoting student achievement and keeping the lines of communication open between the school and the home. Each Randolph County school is well known as a community based and family supporting organization. Every child is important and taught by teachers who care for them. Each school has a nurturing environment and developmentally appropriate strategy for reaching out to every child in the school. But don't take our word on it, come and see for yourself. You are invited to call the school and make an appointment to visit. Come and join in what is truly a family affair at any of our schools. The mission of Randolph County Schools is to focus on student learning in an environment where students feel safe and nurtured and where all students, educators, parents, and community members are valued as important stakeholders. We believe in academic rigor for all students. We believe that student learning should be focused on the accepted West Virginia Content Standards and relevant to work and the world beyond school. We believe that all members of the organization are responsible for building positive relationships with students, parents, and community members. What are the benefits of parent & family involvement? Ways to be involved at your child's school? Make a difference in your child's life. There are many ways parents can help their children in the educational journey. Some parents enjoy volunteering at their child's school; others have work or family responsibilities that make volunteering hard. Some parents like serving on school improvement teams such as the Local School Improvement Committee or PTO/PTA officer and committees that make policy recommendations; others prefer to work directly with their own child's learning activities. One type of involvement is not better than others. The important thing is that parents become involved to help their children succeed in school. 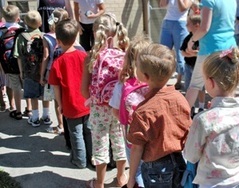 Students must be 5 years old on or before August 31, 2010 to register for Kindergarten. Parents will call the school for an appointment. Parents must present the child's certified birth certificate, immunization records and comprehensive physical form. If a child is currently enrolled in Randolph County Universal Pre-K, he/she does not need to register for Kindergarten.